Chögyam Trungpa Rinpoché's dragon painting. Ink and mineral paints, pure gold paint on a fine canvas. Chögyam Trungpa Rinpoché is principally renowned for establishing the Buddha Dharma in the West. In the United States of America he founded a community called ‘Vajradhatu’ which was later incorporated into the community known as ‘Shambhala International’. He was an accomplished scholar and artist, celebrated widely for his masterpieces. He developed a new expressive style of Tibetan calligraphy known for its ‘nowness’, the meditative approach and the application of the classical Japanese Zen tradition of ‘black ink on white paper’. suggesting this photo was taken off Gibralter. 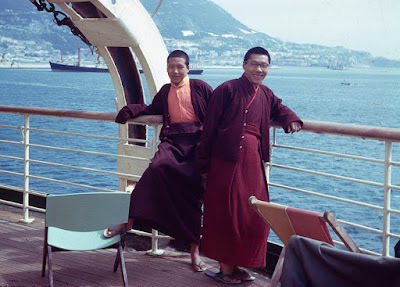 After a dramatic escape from the 1959 Chinese invasion of Tibet, in 1963, at the age of 23, Trungpa Rinpoché first arrived in the UK from India to study at Oxford. By 1967, together with his childhood companion Akong Tulku Rinpoché, they had established the first Tibetan Buddhist centre, Kagyu Samye Ling, in the Scottish border country. Whilst in residence at Samye Ling and before a short visit to Bhutan in the spring of 1968, Trungpa Rinpoché created a unique work of art that is known as Trungpa’s dragon painting. It stands alone in subject and style, unlike any of the Zen-like calligraphy masterpieces that he later produced to communicate Dharma while establishing Vajradhatu in the United States and Canada. 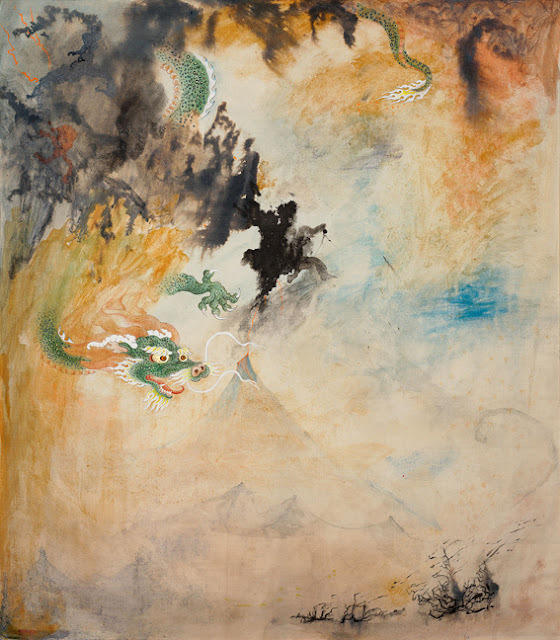 On Trungpa’s departure to America in 1970, the dragon painting was left to the late Josie Wechsler (later known as Ani Pema) one of Trungpa Rinpoche’s early students, who passed it on to another early student, Karma Dechen Rabjor, in whose possession and safe-keeping it remains. In America, Chögyam Trungpa Rinpoché continued a close friendship with the late Sherab Palden Beru, one of the great Tibetan masters of the Karma Gadri art tradition, where Trungpa commissioned Sherab Palden to paint the well-known thangka of Vajradhara, which was for many years housed at the Boulder Shambhala Center, Colorado. This rare dragon painting is composed of several symbolic aspects that Trungpa Rinpoché explained to Josie Wechsler directly and she passed the explanation onto Karma Dechen Rabjor. The significances of the dragon painting outlined below is based on this explanation by Chögyam Trungpa himself obtained from Karma Dechen Rabjor and double checked for accuracy with the late Maggie Russell who had been present at the time of its expalanation. There is no known title for this masterpiece and no calligraphy on it. It is a purely pictorial depiction of a dragon within a volcanic landscape of movement and colour. The first impression made by Trungpa Rinpoche’s dragon painting is of its colourful and loose painterly quality, expressed through a watercolour application that gives the work a contemporary Western appearance, reminiscent of the later works of the English painter William Turner. Also uncharacteristic of the more rigid Tibetan painting style is the energy and movement around the canvas, in contrast to which the dragon that weaves between the inky washes, is carefully created by a more disciplined and traditional form of Karma Gadri Thanka painting. 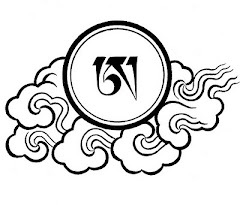 Trungpa Rinpoché freely portrays the relationship between the dragon and the elements of earth, wind and fire. The work tells a story of deep Dharmic significance that later became fundamental to the Shambhala teachings, expressed in such works as ‘Cutting Through Spiritual Materialism’ and to ‘The Sādhanā of Mahamudra’. The latter was composed by Chögyam Trungpa as a meditation practice. Chögyam Trungpa Rinpoché was a lineage holder of two great traditions of Tibetan Buddhism, Nyingma and Kagyu. 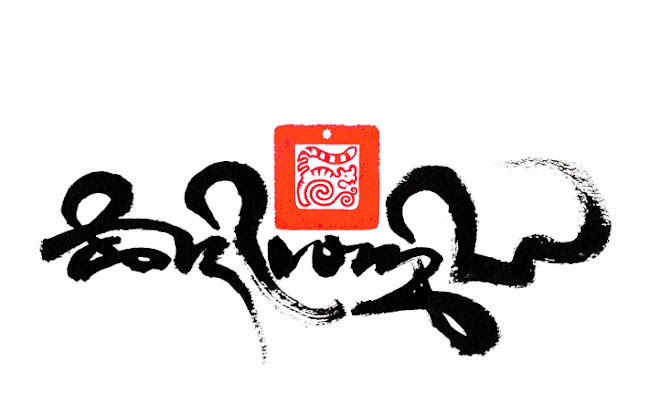 For both, the symbolism of the dragon is explained as the Wisdom and Power of the Buddha Dharma proclaiming the truth, the dragon representing fearlessness of truth and reality. In terms of the Shambhala teaching, the dragon represents the rising of the Great Eastern Sun. Anything else is the setting sun of Samsara, which is explained as making one’s own selfish nest. 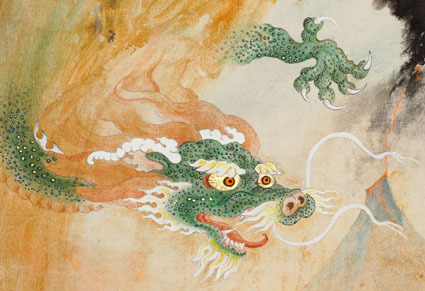 The dragon is painted green, embellished with specks of pure gold, representing the activity of the Dharma. At the centre of the composition is a Tolkien-like volcano, an image of the earth forces of the five elements which represent the disharmony and wrath of the upset Mamos’, celestial beings that are akin to the elements of the earth and especially sensitive to imbalance within the environment. From the volcano erupt electric-flashes of luminous orange that not only flow down as lava, but also dart through the sky as lightening. The word for Dragon in Tibetan is druk, the same name given for thunder. The Lord of Form refers to the neurotic pursuit of physical comfort, security and pleasure. The Lord of Speech refers to the use of intellect in relating to our world and the delusion one reinforces though speech. The Lord of Mind refers to the effort of consciousness to maintain awareness of itself and that holds onto and perpetuates the sense of ‘I’ and its egocentricities. The glorious dragon is seen breaking through the clouds of delusion, flying high above the lower realms of the swirling turmoil of the dark ages. The lower portion of the painting appears as dull-coloured, arid, scorched earth, wind-swept and impoverished, representing the desperate suffering of Samsāra. There is no doubt that the 11th Chögyam Trungpa Rinpoché was a pioneer in delivering Buddha Dharma to the West and was greatly skilled in communicating the complexities and integrity of the Tibetan Buddhist traditions and practices for a Western palate. That he was a master at drawing together both Eastern and Western disciplines is clearly evident in the dragon art-piece, both in application and symbolism, which like a terma has stayed hidden from public view, emerging to be as relevant now as the day it was created. - Tashi Mannox, January 2013, in the year of the water dragon, amended May 2016.